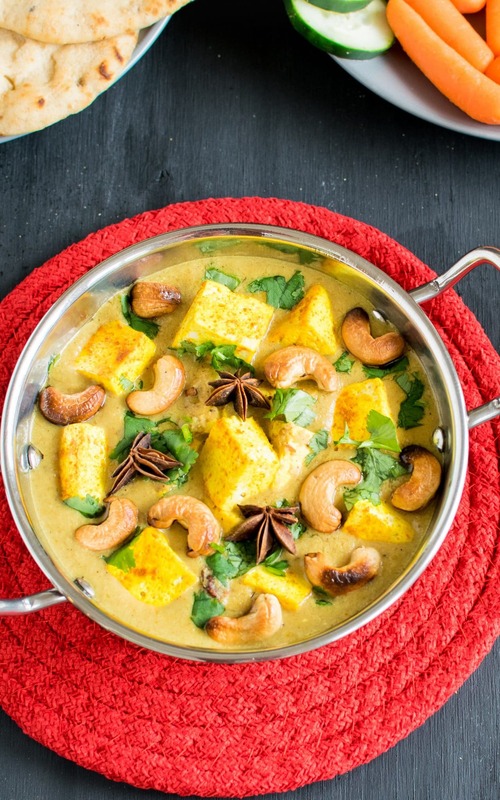 This 30 minutes Turmeric Tofu Cashew Curry is made with delicious Indian spices. It is easy to cook and pairs well with rice/quinoa/naan. 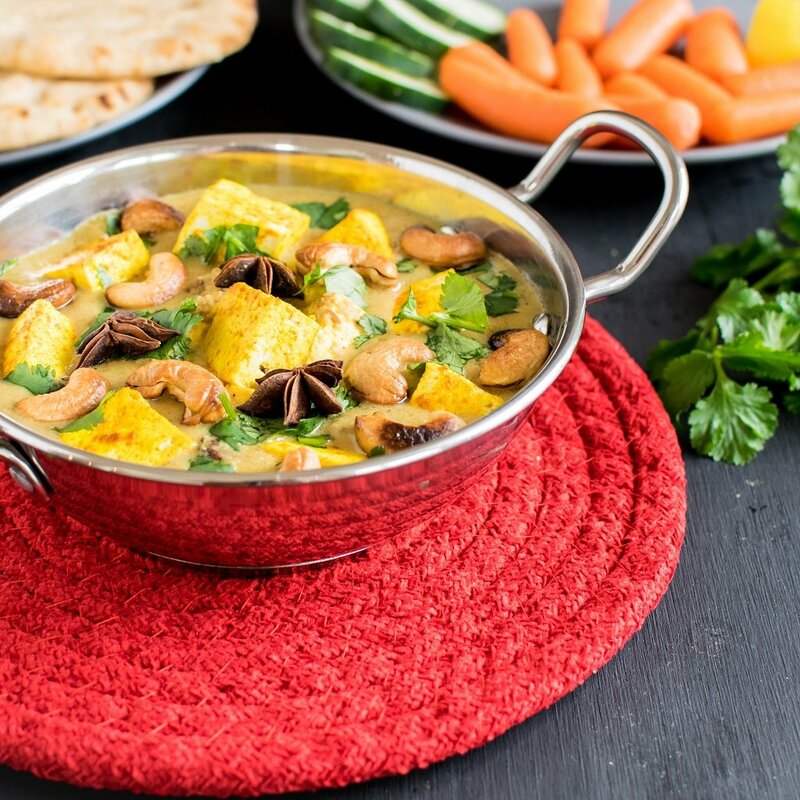 This curry is loaded with antioxidants and is flavorful in every bite. If you are kinda bored of the regular tofu recipes then this is for you. 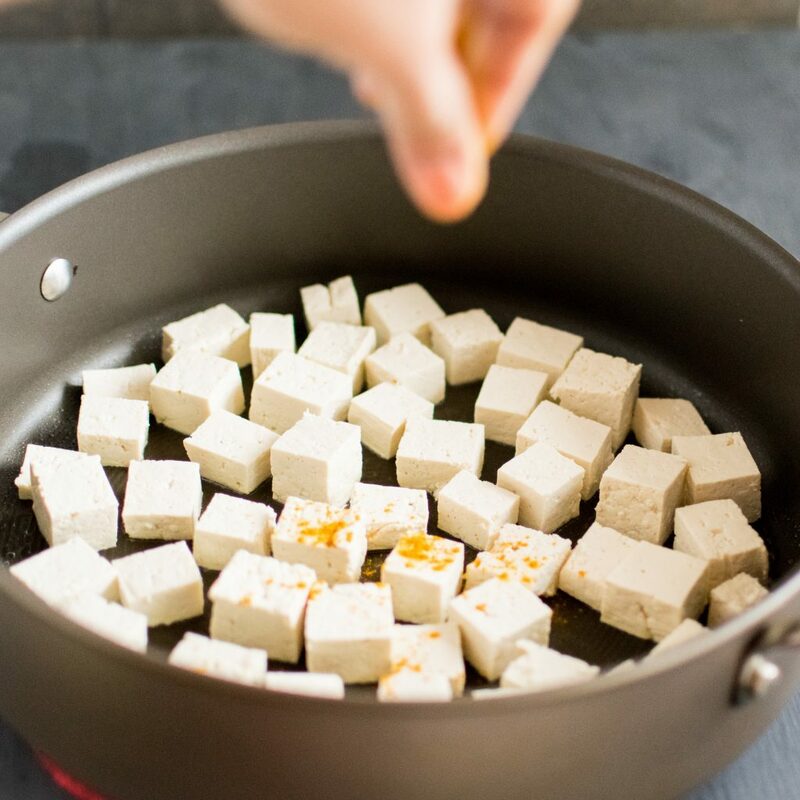 I love experimenting tofu recipes and bring out a new flavor and new taste every time I cook tofu. I like to eat a variety of food from my menu and I hate to repeat the same recipe more than twice in a week and since I eat tofu almost four times a week I ought to create something new out it. Don’t you think so? Well, this Turmeric Tofu Cashew Curry won my heart by just its appearance. It tasted divine when I paired it with whole grain naan and some salad on the side. I was speechless and trust me I have repeated this recipe 4 times in last couple of weeks. I have gone so crazy for this entree that I can gorge on it every week. In my first step I roasted raw cashew nuts to brown and it smelled divine. I also popped many of them even before I started with the recipe. So if you are someone who likes to pop food in your mouth while cooking I would recommend you to roast extra cashew nuts. Then I used extra firm tofu and pressed it as dry as possible and cubed them. In a pan I roasted them along with turmeric powder. Turmeric has lots of health benefits especially as anti-inflammatory. This spice is perfect to boost immunity and fight the foreign bodies which try to keep finding ways into our body. Turmeric is high in antioxidants and is beneficial in preventing cancer. Turmeric has medicinal properties to fight and prevent many diseases. And when I roasted tofu with turmeric powder the vibrant colors caught on to my eyes immediately as well as spruced up the tofu a bit. In my next step I made a paste of roasted cashew nuts along with some onions and other ingredients. When I tossed the paste in star anise flavored oil, the aroma took over my whole house increasing my appetite immensely. By adding coconut milk I made a slight creamy base for this entree. Lastly, I folded in turmeric roasted tofu, garnished with more roasted cashew nuts and it was simply divine. I paired Turmeric Tofu Cashew Curry with whole grain naan and a side onion salad and served it warm. It was a fun dinner evening with my family enjoying my new recipe. This is so easy to cook and gets ready within 30 minutes that you can enjoy it with your family even on a weeknight. You can keep roasted cashew nuts in an air tight glass jar at room temperature ahead of time. Also prepare your tofu a day before and refrigerate it. Just whip up the curry and toss all the ingredients in the pan, your dinner will be ready. Easy……isn’t it? 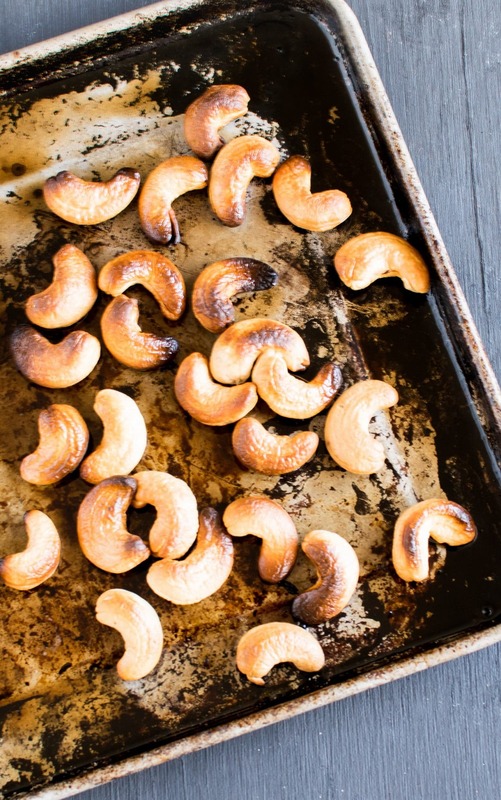 In a greased cookie sheet spread the cashew nuts and place it in a toaster oven in a toasting mode and toast them brown. Let it cool down. (Make sure it does not burn, toasting may take about 2 minutes or less). In small bowl combine turmeric powder and chili powder and keep it aside. Heat a nonstick wok/pan and grease it well. Place the chopped tofu and sprinkle half of the spice powder on them. Flip over the tofu and sprinkle the rest of the spice powder. Cook for few minutes until tofu starts drying up and looks cooked. (Browning not required). Take them out of the pan and keep aside. In a food processor combine onion, half of roasted cashew nuts, ginger garlic paste, cumin seeds, coriander seeds, cinnamon stick and ¼ cup coconut milk process it into a smooth paste. In the same pan heat olive oil and add the star anise. Immediately add the onion paste to the warm oil and cook until it starts releasing its juice sauteing at intervals to avoid sticking. Add water and cook for couple of minutes stirring once. Add tofu pieces and cook again for a minute. Add coconut milk, salt and sugar. Mix and cook covered on a low flame for 5-7 minutes or until well cooked. Turn off the flame add the remaining cashew nuts. Garnish with cilantro and serve warm with naan and or rice. I love tofu. I’m printing out your recipe right now! This looks amazing. This looks amazing! I love all the ingredients in this! Nice contrast of textures. Pinning for later. Thank you Willow. I hope you enjoy this recipe as much as we did. Tasted amazing. I truly recommend this. The star anise brought a nice touch which one doesn’t get to experience often. But the amount of coconut milk was a lot. I only used 2/3 of the amount in the recipe, and the curry still ended up looking more like a liquidy soup with tofu cubes floating here and there. I cut down on the water too, used only around a tablespoon. Thank you Ameron. I am so happy that you liked this curry recipe. I love the subtle flavor of star anise. This looks really good. 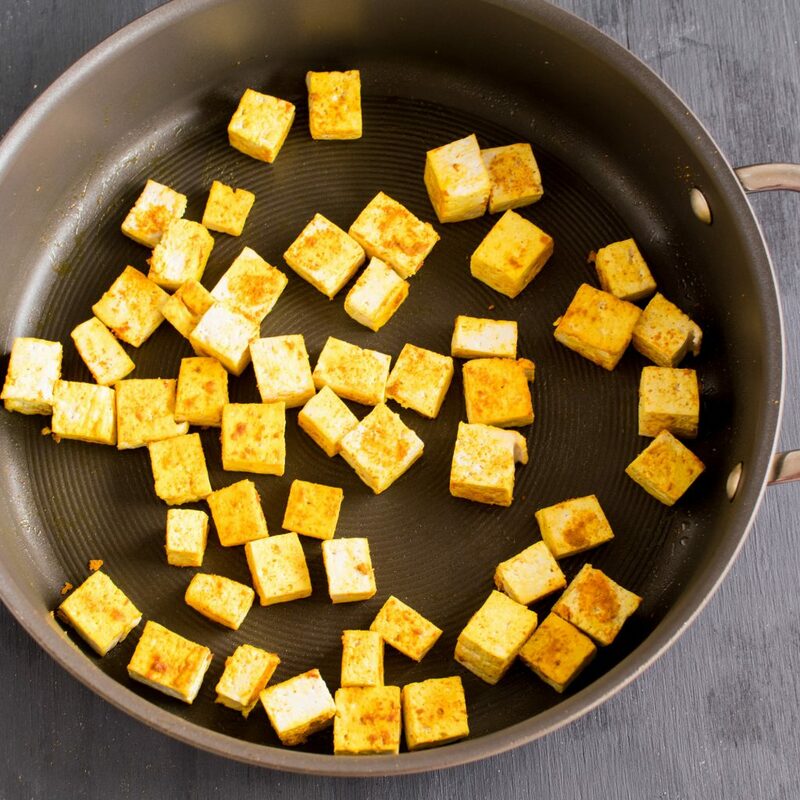 I’ve just started experimenting with tofu and looking forward to trying this! Tofu works great with almost every dish. 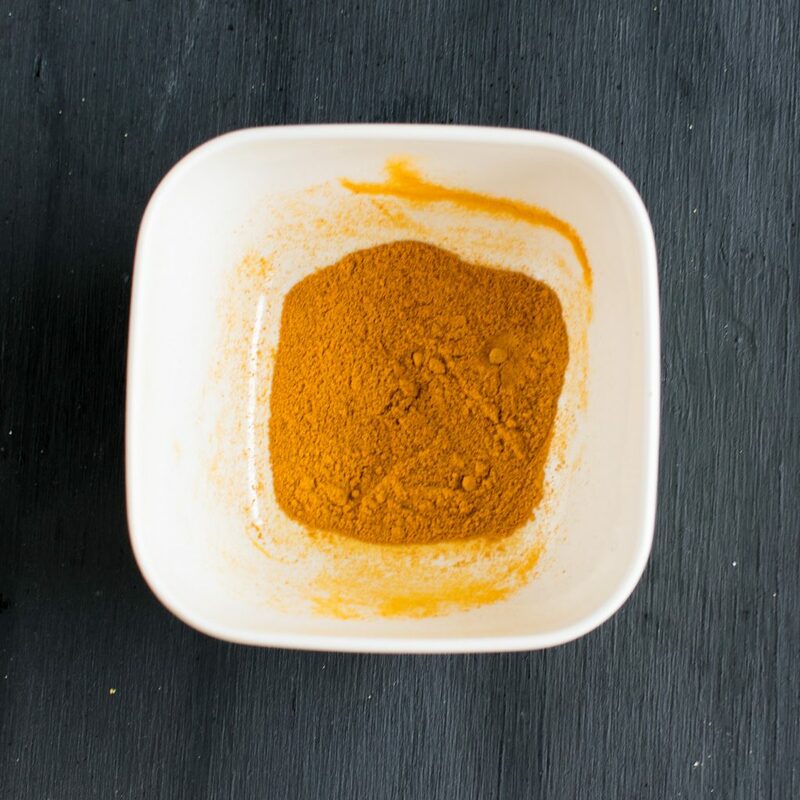 This turmeric recipe with cashew curry looks incredible! This looks so good! 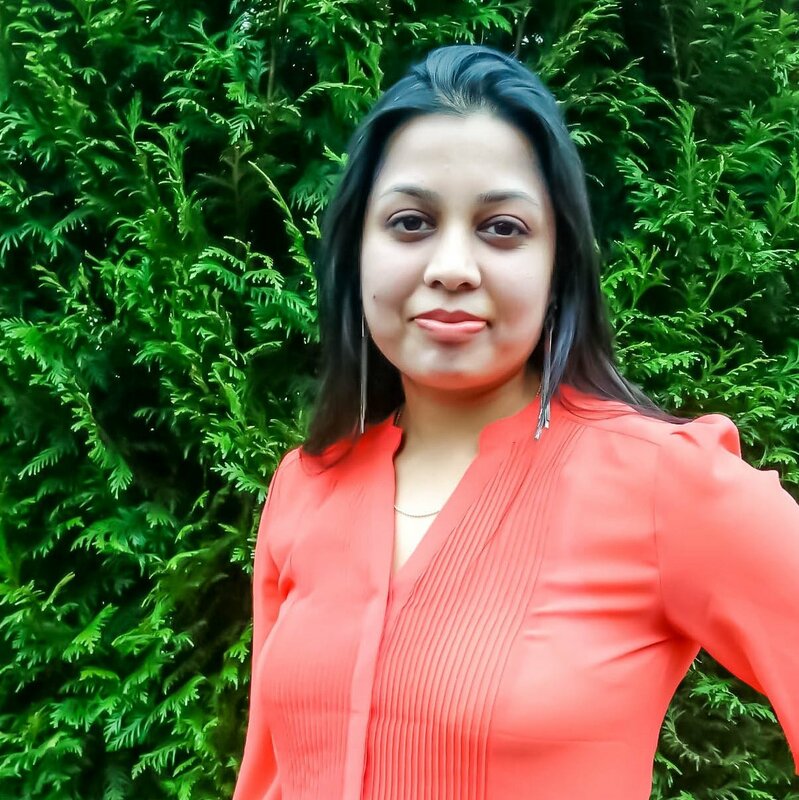 I love trying new curry recipes, so I’ll definitely be giving yours a try! I don’t eat tofu though so I may sub it out for chickpeas! Thanks for sharing! This looks delicious. I add turmeric to a lot of my dishes because it taste great and has so many benefits. I love a good cashew curry. Such a great meatless Monday option!